It is vital for each bus company to have a good route. The city government demands that these routes overlap as little as possible. The first player to choose line expansion (so, the player on square a) must add as many streets to his route as the current maximum number of buses. The player on square b has to add one less, the player on square c two less, etcetera. Note that these players will have their turns in reverse order, the player on square a being the last one to expand his line. To add a new street, place a stick of your own colour on that street. A line can only be expanded at one of its two ends (“heads”). It is obligatory to expand a line in a direction which is still devoid of lines. It is not allowed to build a line parallel to somebody else’s line. There are two exceptions to this rule. 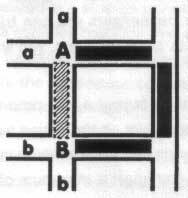 1) When there are no empty streets at one of the ends, you can expand your line parallel to someone else’s line until you encounter an empty street. You may freely choose where to go in such a situation, even if this means that three or more lines will go through the same street. On the next crossing, you must turn into an empty street, if it is present. 2) If the head of your own line ends on the same crossing as someone else’s head, you may build a stretch of road parallel to the other player’s line, even if there are still empty streets. If two or more players already have lines along that stretch of road, both (or all) must have a head at the crossing in question for you to build parallel to them. In any case, at the next crossing you will again have to select an empty street, if it is available. If a player builds a circle, the heads of his line remain at the crossing where the circle has been closed. He or she can only build from this crossing, in two different directions, as there are two heads present. When you close a circle, you should take the action stone from the action board and place it on the crossing to indicate the location of the heads. In this way it is obvious for all players from which point you may build in the next round. The heads should always remain such that the complete route is a line. So, a bus has to be able to travel from one head to the other passing every street exactly once. It is also not allowed to build a line parallel to one of your own lines. Lines that have been put on the board can never be demolished. When playing with five, more sticks are used for line expansions. Every player who chooses this action must add one additional stick. The first player to choose line expansion (so, the player on square a) must add as many streets to his route as the current maximum number of buses plus one. The player on square b has to add exactly as many as the current maximum number of buses, the player on square c one less, etcetera. This rule is only applicable to line expansion.